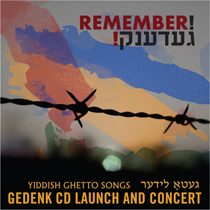 Join us for the launch of the CD, “Remember! Gedenk! Yiddish Ghetto Songs” produced by The Dora Wasserman Yiddish Theatre of the Segal Centre for Performing Arts, and Sidney Zoltak, Shoah survivor, and Montreal Holocaust Museum volunteer. 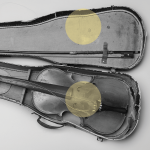 Discover the lyrics and music written about the Holocaust by those who survived, and those who did not. The concert features 16 songs and stories from the CD performed by singers from the Dora Wasserman Yiddish Theatre. Singers at the event include Raizel Candib, Fishel Goldig, Aron Gonshor, Bronna Levy, Burney Lieberman, Lisa Rubin, Sam Stein, Judy Strauber and Sidney Zoltak with Music Direction by Nick Burgess. Tickets can be purchased through the Segal Centre for Performing Arts and cost $15 or $30 including the CD.